After a good deal of brinkmanship, the European Union (EU) has agreed to offer the United Kingdom a short extension to Brexit preparations. But we’re skeptical that a short delay can fix the underlying problems that both sides face. The EU has said if Prime Minister Theresa May cannot garner parliamentary support for her negotiated withdrawal agreement before March 29, it will offer to delay Brexit for two weeks. But in our view that represents little more than a postponement of the current situation. The preferred outcome for both the United Kingdom and the EU remains a deal. But we think that would require some flexibility from the EU side, which it has so far been reluctant to offer. So a no-deal Brexit remains very much on the table—we’d estimate it has around a 30% possibility— and without any rapid progress, that likelihood will keep increasing. Despite the rhetoric, we’re not sure either side is ready for a no-deal Brexit. Neither the United Kingdom nor the EU seem to understand the full implications of the UK crashing out without a deal. In recent days, a report from the Bank of Spain predicted a Hard Brexit could reduce Spanish gross domestic product by 0.82 percentage points over the next five years.1 And, we expect other EU economies could be similarly affected. With uncertainty at elevated levels over the coming days, we think financial markets will remain skittish. We’d expect sterling to remain range-bound, with the latest headlines dictating its movement. It should be a similar story for UK government bonds. 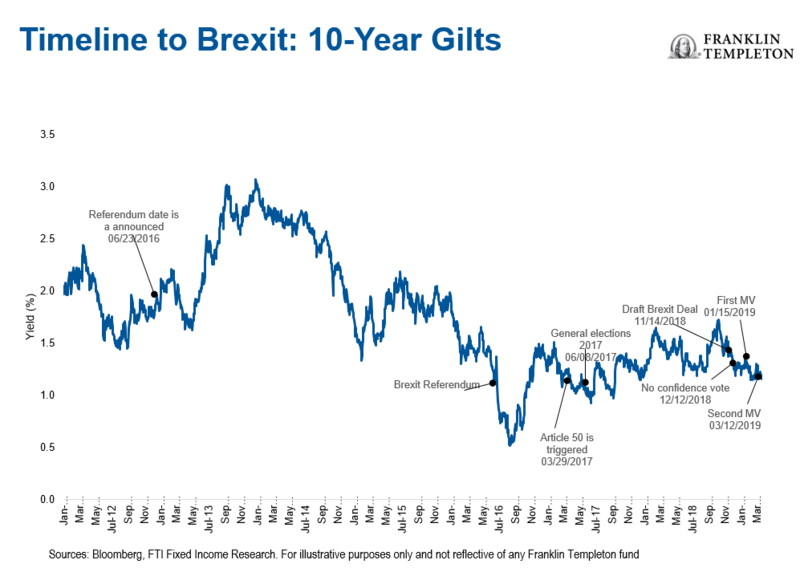 We’d expect gilts to remain quite well bid until we get more certainty. The short delay could offer the opportunity for what has been termed a “managed no-deal Brexit.” In that scenario, the UK would leave the EU without a deal, but having had time for both sides to prepare contingencies. We’d hope the negative impact on the wider economy would be less than a no-deal Brexit on March 29, as there should have been time for the likely shock to be managed. A number of standstill agreements have been agreed to keep relationships on the same footing, at least temporarily. For example, Ireland and Northern Ireland have agreed not to erect a border on day one, and a number of regulators have agreed that certain financial market transactions will continue unaffected. But, these agreements will probably only remain in place for a short period of time. In due course, changes will have to be made and new arrangements put in place. Afterall, even after Brexit, the UK should still be the sixth or seventh largest economy in the world. Its relationship with the rest of the world is likely to be problematic for a period of time, but it’s not going to disappear. All investments involve risks, including possible loss of principal. Bond prices generally move in the opposite direction of interest rates. Thus, as prices of bonds in an investment portfolio adjust to a rise in interest rates, the value of the portfolio may decline. Investments in foreign securities involve special risks including currency fluctuations, economic instability and political developments. 1. Source: Banco De España Brexit: Balance De Situación Y Perspectivas, March 19, 2019.